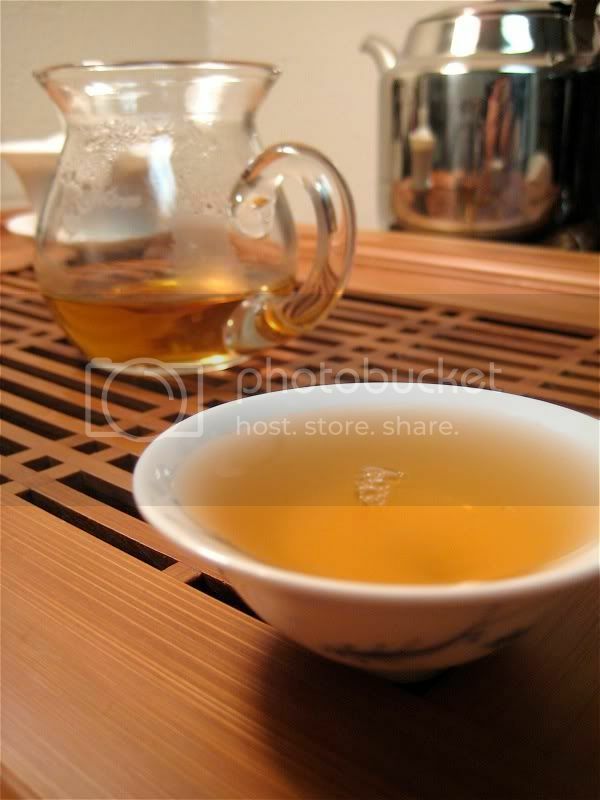 This is the last of the three Dan Cong samples provided by Salsero and Tea Habitat. I have had a few aged oolongs which really knocked my socks off, so I had high expectations for this one. Sadly, it didn't turn out as I had hoped it would. I blame my less-than-stellar experience largely on my failure to brew it right, as others (whose tastes I trust) seem to have been very happy with it. 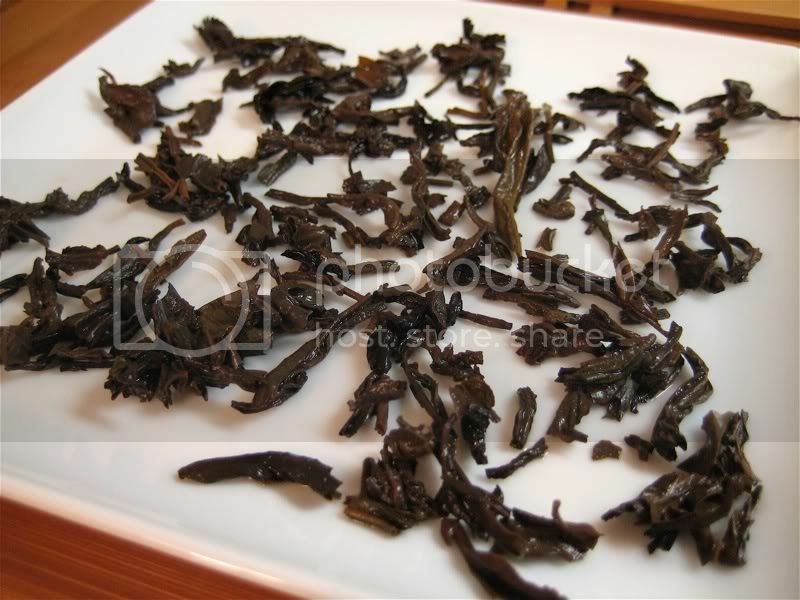 The dry leaf is as one would expect from an aged oolong— dark, and fairly broken up. I couldn't detect much of an aroma from this tea. There is some fragrance, but it is light and hard to examine. It did remind me of the 1982 aged Wenshan Baozhong though, in that there was some sort of musty and minty thing goin' on. I tried to follow Imen's instructions, but apparently I failed. I used 3g of leaf, less than the two newer Dan Congs, did a flash rinse (which I ended up drinking anyway), then let the leaf and gaiwan cool down, and then proceeded with brewing. I wonder if I would have gotten more aroma from a more conventional set of parameters, by keeping everything hot. 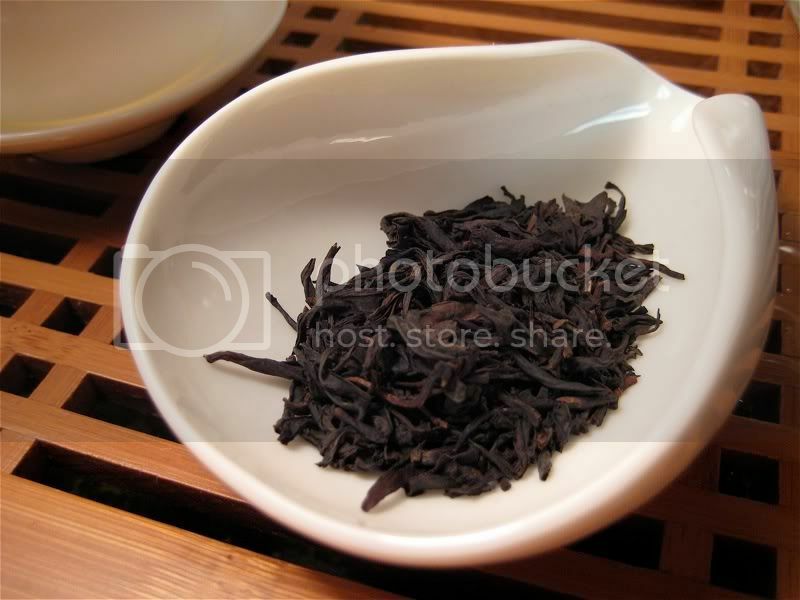 The flavor was also similar to the aforementioned aged baozhong, but again much lighter. I really couldn't seem to pull much out of this tea, besides some light (but good) flavors and side-effects. One interesting thing, which was also noticed by Alex, was the slight puerh-like character of this tea. I noticed it in the liquor, as it seemed to have a certain activity on the tongue I normally get from slightly-aged (a few years) puerh. There was a nice stimulating astringency in some infusions, and there may also have been some faint cha qi, though I am notoriously bad at detecting it. Overall, I thought this tea had the potential to be quite interesting if one brews it correctly— it's too bad I didn't! As for my favorite of these three Dan Congs, I was happiest with the 2007 Yu Lan Xiang Dan Cong— I would certainly consider buying more for special occasions, at the very least. Thanks again Salsero!